When I received the invitation for the Converse Weatherized Fashion Contest where I'll be going head to head with the metro's top lifestyle and fashion bloggers, I cannot help but to ask myself, WHY ME? Me strutting this weird style most of the time, me wearing these clothes and apparels that are bordering weirdness and coolness at the same time, and me making some heads turn with mixed facial expression from everyone - I guess there's really something with my style after all to be invited here! Happened at Converse flagship store in Glorietta 2, Makati City, about 23 most well-known bloggers of the metro (really, I cannot believe I'm one of them) scanned, picked, wore and modeled Converse's latest clothes and apparels, collectively known as the Converse Weatherized Collection. Led by the brand's Chuck Taylor style, Converse Weatherized Collection is what the brand is sharing this Holiday season. 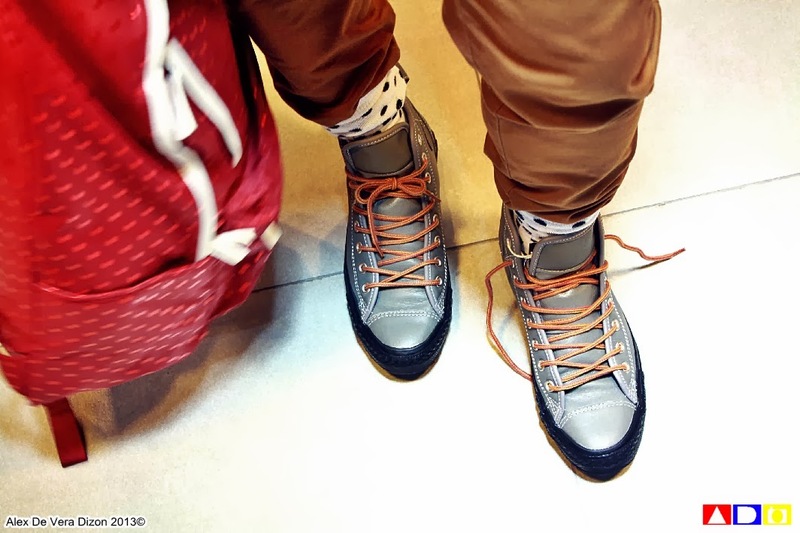 The de rigueur fashion statement of the season, the 2013 Chuck Taylor All Star Weatherized Collection displays a rough-hewn look perfect for the urban style we have now here in the Philippines. They are worn by those who want to experience life in all its textures and complexity, the perfect antidote to the safe and the expected fun and young life we all love to have. The color palette for this collection resembles the earthy colors depicting urbanized class and style fit both for men and women. And without even adjusting your sense of fashion, each set matches the in-season style and colors made to set the mood on this Yuletide cheers. The moment I arrived at the venue, I was immediately welcomed by tons of 2013 Chuck Taylor All Star Weatherized Collection stocked in all parts of the store. I was one of the first few to get there, so I was able to see every piece both for men and women. 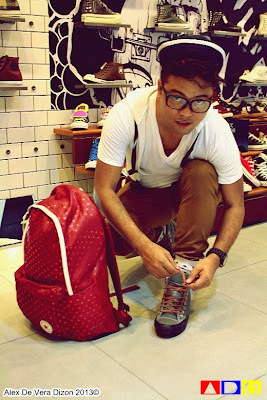 With my "nerdy" look ready go that day for a photo shoot, I know that adding some Converse apparels to my "signature" style would give me the "fighter" spirit that will make me pose for camera (if you've been following me, you'll know that I'm more of a behind-the-camera person, so posing in front of the camera is really a challenge already for me). I'm used to wearing the plain-colored Chuck Taylors, and I honestly didn't think I will LOVE these new sneakers. The color, style, appeal and texture though carrying that famous Chuck Taylor design, is exceptionally punked up and manned up! I like the idea that most of them come in this really urbanized look - something that can go well with my modern nerdy look. White hoodie top, brown pants, sailor hat and nerdy glasses, all I'm looking for then is a nice pair of sneakers from 2013 Chuck Taylor All Star Weatherized Collection and a nice bag that can punked up my look. The sneaker collection that they handed to me was really mouthwatering, seriously. Behind my mind, I am actually planning to take them all home because I know that despite of my weird sense of style, each will blend well making me feel "fashionista". So for the sneakers, I personally think that the color gray is the in-color for this season. 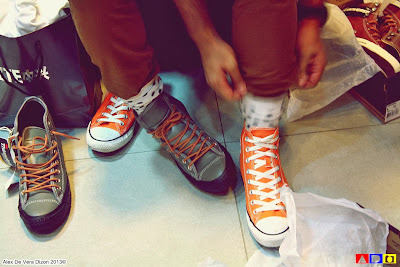 I picked this charcoal gray Chuck Taylor All Star Hollis that didn't exactly blend well with my style. But I'm more grateful it actually didn't because it stood out among the rest of what I'm wearing. Its details are the love - from the one-inch black sole that kinda remind me of army boots, to the soft-textured kinda-leather foxing, counter and quarter, to the soft insole that made my feet, specially my toes, at peace inside it and the brown laces that somehow go well with my pants - the love, really! 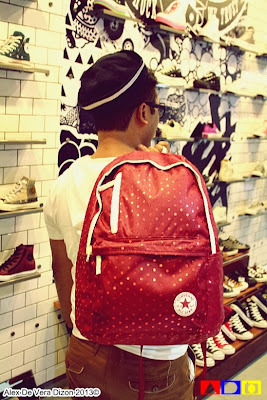 As for the bag, with my polka-dot socks, I picked this Alpine backpack. More than just looking lucky, the color of it highlights the rest of my outfit's color giving me this really "head-turner" look. I LOVE! And with its Christmas-y design, I can feel that anyone who sees it will simply feel happy. I actually didn't come that prepared having just the clothes that I am wearing for this contest, but I'm confident that I'll be able to come-up with something that will speak more of me, punked up with 2013 Chuck Taylor All Star Weatherized Collection. So what do you think? Let me know through your comments below! I'm not perfect just like our "weather" here in the Philippines, but come on it's the one that challenges us to be strong and unique at the same time. 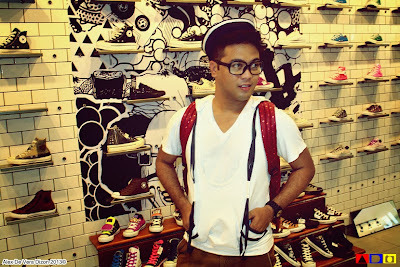 Thank you for the fun experience of being a model for a day, Converse Philippines!